I’m still trying to get a hang of understanding the biology part of this class, but reading these texts were helpful refreshers of DNA and genome sequences. I was for the most part honestly terrified doing the reading, not only because of the implicit bias that none of the author’s seemed to address as well as the content! I don’t think at this point I’m 100% against using CRISPR but I think I’m like 95% against using it! The author’s all used language like “when it is introduced into the wild” as opposed to “if…” which I thought was kind of wild and I am not convinced at this point after all of these readings, that there are regulations that are responsible, unbiased (as possible) nor strong enough to start positing when we introduce this stuff into the wild. It actually reminded me of the reading I did for Marina’s class last week that outlined the issues of people not being able to address issues in a “systems thinking approach”. Using science experiments around GMO use, the author writes how regulatory entities are often driven by capital, and even government and political forces support these loose regulations bc they get money for this type of science. Another area that continued to come pup in the reading was CRISPR’s potential to fight disease. I kept wondering what this says about industrialization of medication. 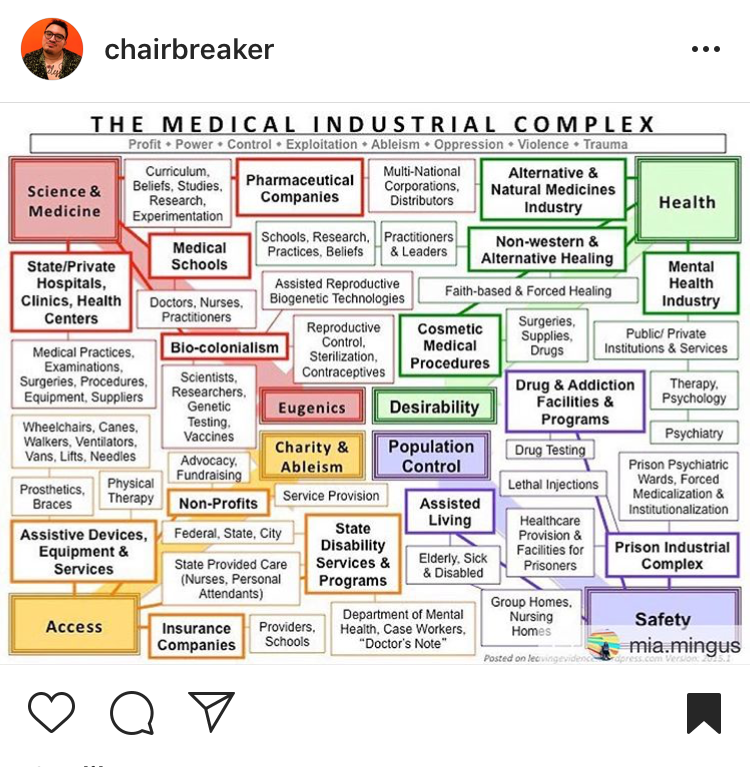 It reminded me of this chart I saw earlier this week about the medical industrial complex, that for me does work of looking through the industry and financial dependency on “health” as well as how fear of death / fear of illness can manifest as eugenics and population control. I think for me this is a “just because we have the technology doesn’t mean we should use it” situation. There are other ways to fight cancer (specifically “upstream” preventative methods). Anyway, I’ve been thinking a lot about a specifically U.S. desire to control nature (loved the first article’s Frankenstein-esque image) and also our fear of surrendering. I think that as the semester goes on I’d like to tackle these themes! I applaud your hesitation and discomfort around CRISPR – especially how its use is considered a “when” not an “if” even when very little long term testing has been conducted. The culture here in the US, particularly in the medical industry (the MIC chart is fantastic (ally) depressing!) is a race to profit/cure – in that order. Thursday’s class on ethics will address (likely not solve) issues surrounding biotech in our future.